George Hamilton is an American television and movie star. He's had two Golden Globe nominations for his roles in Love at First Bite (1979) and Zorro, The Gay Blade (1981). George Hamilton is the son of bandleader Spike Hamilton whose band was based at the Biltmore Hotel in Los Angeles. 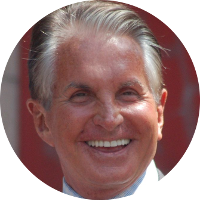 George Hamilton is arguably best known for his “perpetual” suntan. George Hamilton has a number of U.S. Presidential kin including Abraham Lincoln, James Garfield, Herbert Hoover, Gerald Ford, Frankln D. Roosevelt, and both Presidents Bush. U.S. First Ladies in his family tree include Jane (Appleton) Pierce, Edith (Carow) Roosevelt, Edith (Bolling) Wilson, and Barbara (Pierce) Bush. George Hamilton also has family connections to the British royal family including Catherine Middleton, Princess Diana, Queen Elizabeth II, and at least four wives of King Henry VIII, Anne Boleyn, Jane Seymour, Catherine Howard, and Catherine Parr. His celebrity kin include Alan Ladd, Humphrey Bogart, Amy Grant, Sally Field, Kate Upton, Keri Russell, Kyra Sedgwick, Christopher Reeve, Olivia De Havilland, Judy Garland, and Elizabeth Montgomery.